In the harsh environment along Canada's only arctic road, the Dempster Highway, the northern lights stream across the sky. The Dempster Highway stretches from Dawson City in the Yukon to Inuvik in the Northwestern Territories and passes some of the most stunning and spectacular scenery enroute to the Beaufort Sea in the north. 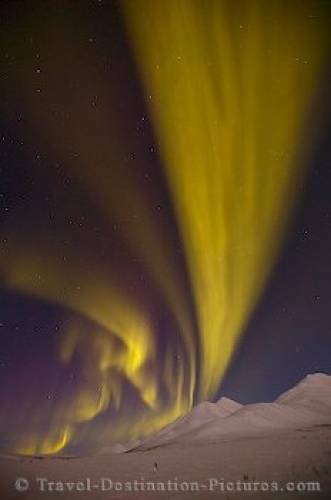 The northern lights are frequently encountered along the Dempster Highway and often become more vivid the further north you go. One of the best times for high activity of the northern lights is in the spring and the Dempster Highway is one of the best places to see them. Dempster Highway in the Yukon, Canada.